"KING SOLOMON'S MINES" 1951 Avon one-shot based on the movie and the novel by H. Rider Haggard. KING SOLOMON'S MINES. AVON ONE-SHOT 1951. Staples tight to book and centerfold. Top staple pulling a little from cover. NOTE: We don't grade any raw books higher than 9.2, as once you go higher than that grading gets really subjective. How do you grade?. 1.0 FR Fair. Size: 7" x 10". The price may vary based on size, weight, and location. Grade: GD 2.5. Art by Everett Raymond Kinstler, Vince Alascia and Gene Fawcette. Tarinda battles the priestess of Koomalo atop a rocky crag in the Mountains of Madness. Also featuring a terrific contents page by Everett Raymond Kinstler on the inside front cover. HE-MAN COMICS #1 1954 Powell kunstler art. Shipped with USPS First Class Package.up.for.sale.is a.g/vg copy.of Heman number one from 1954 its.complete.and.a.hard to.find issue there is.tape.on the.spine. look at.the.imagesit is published by tony press . Art by Louis Ravielli and Charles Sultan. Cover by Everett Raymond Kinstler. 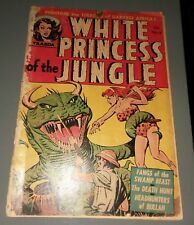 In the tradition of Sheena and Tarzan, redheaded, blue-eyed jungle queen Taanda rides a trained zebra and fights for the people of her adopted tribe, the Tauruti. Cover detached and split at spine; brittle around edges; pieces out. Interior pages brown; two centerfolds detached and one is very torn up and stained but story is complete. Tear through book at staple (small). 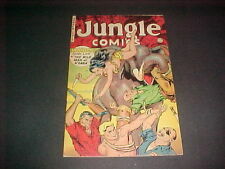 Everett Raymond Kinstler art in two stories, "Jungle Vengeance" and "Death Wears the Jungle Crown," plus inside front cover. Other stories include "The Witch Doctor Murder Cult" and "The Strange Mission to Ormuz.". In the tradition of Sheena and Tarzan, redheaded, blue-eyed jungle queen Taanda rides a trained zebra and fights for the people of her adopted tribe, the Tauruti. Also featuring a fun cover, possibly by Everett Raymond Kinstler, and a dramatic contents page on the inside front cover. Grade: GD 2.0. Art by Everett Raymond Kinstler, Vince Alascia and Gene Fawcette. Tarinda battles the priestess of Koomalo atop a rocky crag in the Mountains of Madness. Also featuring a terrific contents page by Everett Raymond Kinstler on the inside front cover. Slave Girl. Publisher: Avon. Cover is detached from book. Centerfold loose at top staple. Pages are off-white and supple. Howard Larsen cover and art. Comic lays flat with nice gloss and colors. Very attractive book, present much nicer than technical grade. Art by Everett Raymond Kinstler and Gene Fawcette. Cover by Everett Raymond Kinstler. 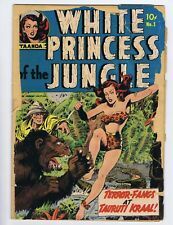 In the tradition of Sheena and Tarzan, redheaded, blue-eyed jungle queen Taanda rides a trained zebra and fights for the people of her adopted tribe, the Tauruti. Everett Raymond Kinstler cover. White Princess of The Jungle. -Cover detached and almost separated, but book interior is nice. -First issue. Issue: 1 /Year: 1951Condition: G.
Grade: GD- 1.8. Art by Everett Raymond Kinstler, Vince Alascia and Gene Fawcette. Tarinda battles the priestess of Koomalo atop a rocky crag in the Mountains of Madness. Also featuring a terrific contents page by Everett Raymond Kinstler on the inside front cover. Book has 36 pages.Book is a CANADIAN EDITION graded GOOD .